through it, to other equally wide and deep wells of sound. white, a bomb exploding with its own joy, kept cutting in. aftertaste of irony. have i said goodbye to the pork-pie hat? Evie Shockley’s most recent book of poetry, the new black (Wesleyan), won the 2012 Hurston/Wright Legacy Award in Poetry. 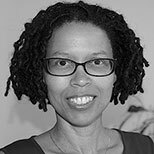 She is also the author of a half-red sea (Carolina Wren Press), two chapbooks, and a critical study, Renegade Poetics: Black Aesthetics and Formal Innovation in African American Poetry (Iowa). From 2007–2011, she co-edited the poetry journal jubilat; she now serves as poetry editor for Feminist Studies. Recipient of the 2012 Holmes National Poetry Prize, Shockley is Associate Professor of English at Rutgers University-New Brunswick.